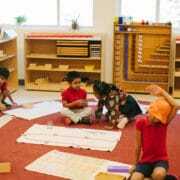 In a Montessori school, educators don’t merely teach lessons out of a textbook everyday, like you may see in a traditional school. Many of the lessons that Montessori educators teach are valuable life skills that a child will carry with them for a lifetime. 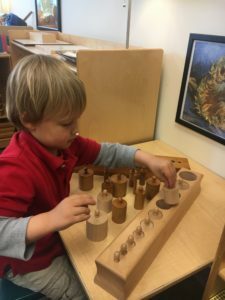 Montessori schools focus on developing every aspect of the child – physical, social, emotional, and cognitive. These elements make up what Dr. Montessori calls the whole child. We know human beings are social creatures by nature. We not only depend on each other to fulfill our physical needs, but emotional and spiritual as well. The idea of “culture” is based on the myriad of different ways that groups of humans have devised to meet these needs. 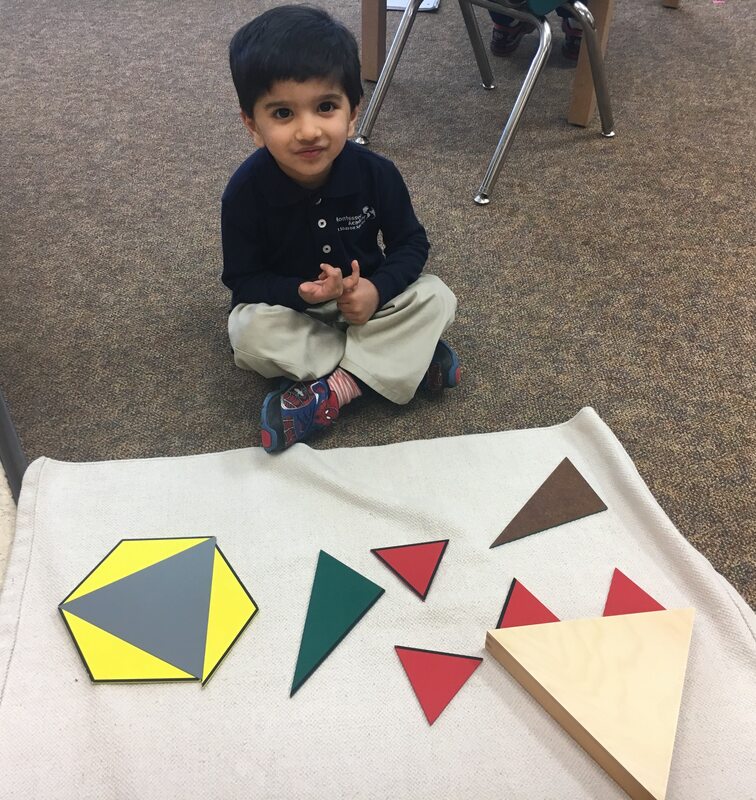 Mixed age classrooms are a signature element of a Montessori school because Dr. Montessori believed that children learn from one another. This is proven in the Montessori environment where you will often see an older child happily helping his younger peers and gaining social maturity from being a role model. The younger child may learn new concepts from the older child and as she looks up to the older child, she will begin to see that she too, will be just as capable one day. Growing together is natural, as children instinctively know when to offer help, encouragement, and comfort to those around them. Hence the mixed age group means that children have the opportunity to interact with both older and younger peers, all of who are at varying levels of individual development. The mixed age group provides daily opportunities to practice patience, tolerance, and receiving or offering assistance. Younger children look to the older children with admiration and for inspiration, and in turn, the older children help and teach the younger children. Although the Montessori focus lies in individual progression and many lessons are presented individually to the students, some lessons are presented to students in small groups. These small groups are great for dialogue and encourage children to share their thoughts regarding particular subjects. The safe environment of the small group also makes children feel comfortable expressing novel ideas with their peers. The small group sessions improve a child’s conversational skills and helps them grasp and understand important concepts. Too many materials in the classroom could cause clutter and confusion. However, if there is one complete set of materials for the classroom, then the children will benefit from a sense of order. If a child wants to work on something that involves a material already being used by another child, then they will have to respectfully wait their turn. This teaches the child the virtue of patience and provides them with the opportunity for maturity. 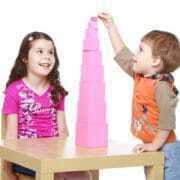 Developing the social skills of grace and courtesy is a key component of the Montessori curriculum. In a Montessori environment, children learn how to interact appropriately with each other and with adults through dialogue. Some of these interactions including greeting and hosting guests into the classroom, preparing and sharing snacks with peers, and exercising appropriate mealtime behavior. One of the main values that are taught in a Montessori classroom is respect. By teaching respect for their peers, materials, and themselves, Montessori educators plant a seed of compassion and empathy in the children. In a Montessori classroom, children learn how to resolve conflicts and issues by making peace with others. This is often done at the “peace table” and achieved through sharing a “peace object” of some kind, such as a rock or a flower, which is passed back and forth as the children acknowledge their feelings and express themselves. 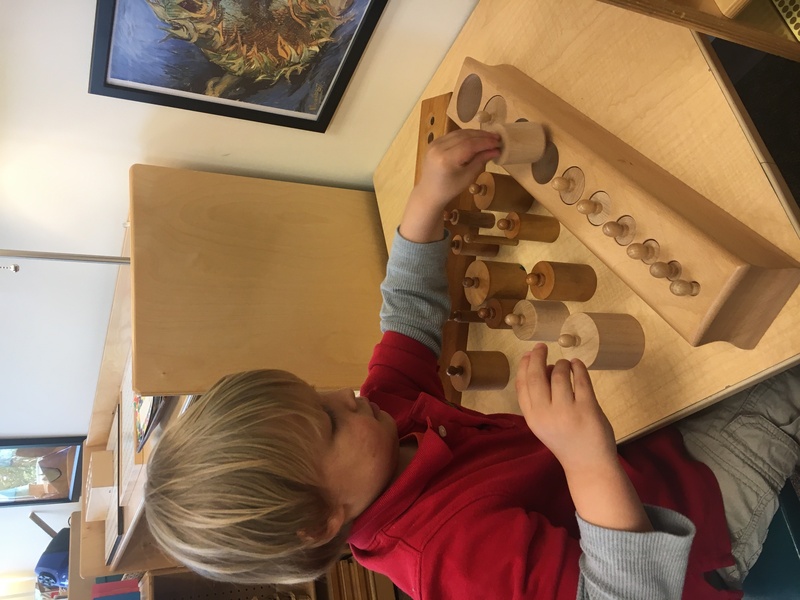 At Montessori Academy at Sharon Springs, we have created a rich, well-prepared environment designed to meet the needs of our young children. 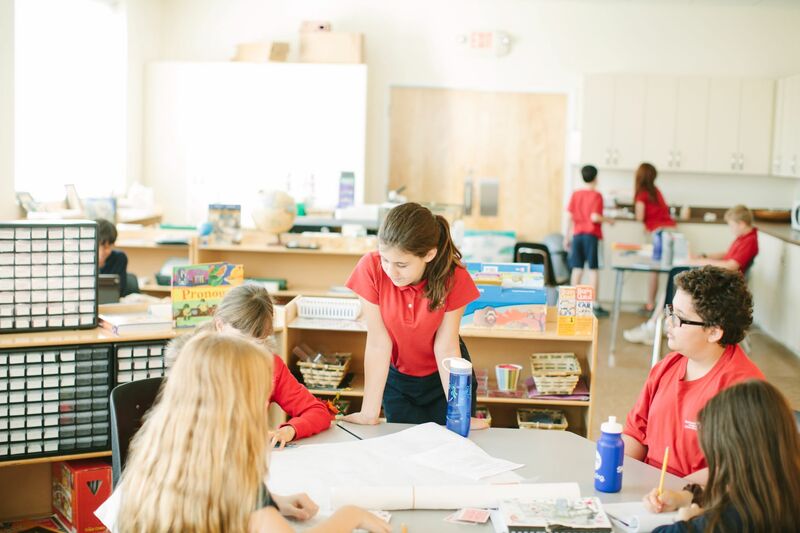 The classrooms at MASS are carefully constructed to help children understand the world around them. Our educators focus on helping children form a positive self-image and develop respect for all life. Edudemic shares an interesting perspective on current developments in the classroom, including the incorporation of various forms of technology – how teachers feel about the top 10 current educational trends. European and North American teachers were polled by Menco Platform, social knowledge-sharing platform, to see which trends were exciting and which were more hype than substance for classroom leaders. The results paint an interesting picture of the future of technology and its role in the classroom. I am a parent who learned from my own children what education can be. 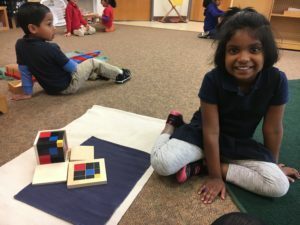 Kay and Selby see Montessori as the vehicle to independence, allowing each person to reach their potential by following their personal passions. 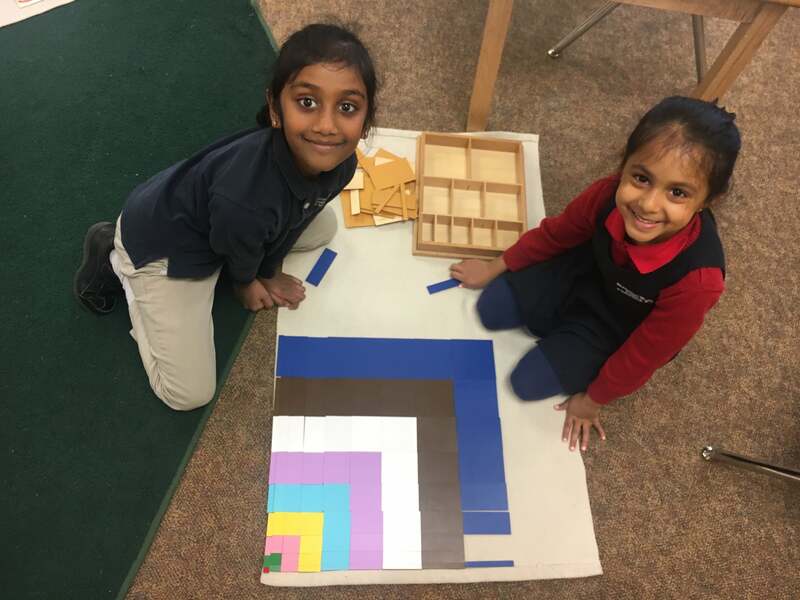 Their goal in making the documentary is to share with the world the potential of Montessori to change the conversation and start a movement toward truly meaningful education. Montessori is a buzzword in today’s talk about education reform – peaceful education based on respect and kindness. Couldn’t we all use a little more kindness in this world? Please enjoy the trailer. We hope to show the documentary at our school in the future. https://montessoriacademysharonsprings.com/wp-content/uploads/2016/01/logo.png 0 0 Judd Dunagan https://montessoriacademysharonsprings.com/wp-content/uploads/2016/01/logo.png Judd Dunagan2013-08-09 20:45:122017-11-13 07:50:41What Is Education For?